Isomers, Enantiomers and Activated Forms: Part 1 – When does the exact form of a nutrient really matter? Over the past six months, I have been working on a big project (soon to be announced) evaluating a whole host of assumptions and presumptions concerning nutrients and their various forms. Natural vs. Synthetic, isolates vs. complexes, “activated” forms and chiral enantiomers. I hope to use a few separate blogs to help clinicians, researchers and interested nutrient aficionados understand when these differences appear to matter (at least in a way that can be measured). By the way, we will also try to make sense of all this d,l and R,S confusion that only seems to make sense to organic chemists. Some of the ones we will be covering over the next few blogs include: natural vitamin E (d-alpha) vs. synthetic vitamin E (d,l-alpha tocopherol); alpha vs. beta, gamma, delta tocopherols; vitamin K1 vs. K2; phosphorylated B6 and riboflavin forms, methylated folate and B12, R-lipoic acid vs R,S-Lipoic acid, Co-Q10 (ubiquinone) vs. ubiquinol and a few others that crop up now and again. Knowing that these topics can be a bit controversial, I want to start with one that is sure to stir the pot a little, but is fairly straightforward to explain: phosphorylated B-vitamins. It is quite common, especially here in the US, to hear well-regarded clinicians recommend the use of activated B-vitamins from the podium of prestigious integrative medicine conferences. Along with methyl-folate and B12, this list usually includes pyridoxal-5-phophate (P5P) and riboflavin-5-phosphate (R5P). But is there any evidence to suggest that either of these forms is better than their “inactive” counterparts? In fact, there is not; and the reason is shamefully obvious: both P5P and R5P must be de-phosphorylated prior to transport into the body. Food sources of vitamin B6 are found in all three forms (pyridoxine (PN), pyridoxamine (PM), pyridoxal (PL)), as well as each of their phosphorylated and glucoside-conjugated forms. All phosphorylated compounds are hydrolyzed into their respective un-phosphorylated form prior to absorption, after which in vivo conversion allows each to act as vitamin precursors. Phosphorylation of the coenzyme form occurs, as needed, in the liver. (See the figure from pg 176 of Present Knowledge in Nutrition-7th edition). 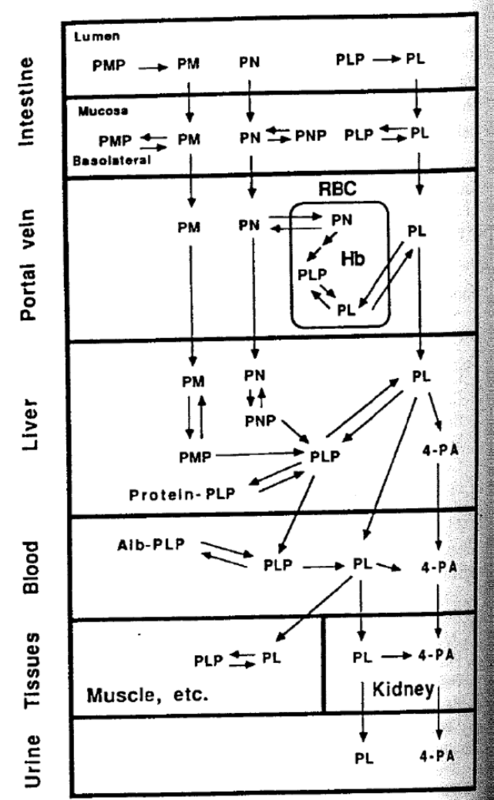 Note that in each case the form of B6 is transported from one tissue to another, the phosphate portion is removed. The same phenomenon exists for riboflavin and riboflavin-5-phopshate. Riboflavin is naturally found in foods as either free riboflavin or one of its co-enzyme derivatives (FAD/FMN). The bioavailability of these compounds is similar since each form is hydrolyzed to free riboflavin prior to transport into the body. The similar pharmacokinetics of oral R5P (and its need for de-phosphorylation) compared to pyridoxine HCl have been known for over 45 years! So why is this so important? If they are the same, why bother with it all? Well first let’s also add to our discussion that the raw material cost (both in dollars and energy) is greater using these forms (about 3-times higher for R5P and about 7-times higher for P5P) and they are no more “natural” since each is chemically synthesized from either free riboflavin or pyridoxine HCl, respectively. Beyond the cost difference for the use of ingredient with no additional benefits, there are two other concerns that I would like to raise before closing. The first is that the blanket notion that consuming the “active” form of a vitamin will somehow improve the overall benefit of an oral supplement simply teaches the wrong view of vitamin physiology. All vitamins function in the body by a constant conversion between various active and inactive forms. In many cases, active vitamins are converted to their inactive forms (intentionally) by specific enzymes in order to transport vitamins from one part of the body to another. Inactivating the vitamin prevents it from inappropriately reacting prior to reaching the target tissue. Secondly, when such broad statements about “activated” vitamins are made, it makes it more difficult to explain the true differences between certain nutrients, when proven differences actually exists (many of which we will cover in future blogs). I am fairly certain that most clinicians, nutritionist, dieticians and even supplement manufacturers are unaware of this information (even though it is in all the textbooks); so no need to panic. In this case, these phosphorylated forms are not necessarily less clinically effective, they are just less cost effective ways to deliver the same nutrient. • Waldmann A, Dörr B, Koschizke JW, Leitzmann C, Hahn A. Dietary intake of vitamin B6 and concentration of vitamin B6 in blood samples of German vegans. Public Health Nutr. 2006 Sep;9(6):779-84. • Gregory JF 3rd. Bioavailability of vitamin B-6. Eur J Clin Nutr. 1997 Jan;51 Suppl 1:S43-8. • Bates CJ. 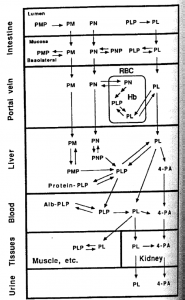 Bioavailability of riboflavin. Eur J Clin Nutr. 1997 Jan;51 Suppl 1:S38-42. • Jusko WJ, Levy G. Absorption, metabolism, and excretion of riboflavin-5′-phosphate in man. J Pharm Sci. 1967 Jan;56(1):58-62. If you want to know when Dr. Guilliams posts future blogs or when a new whitepaper is available, “Like” us on our Facebook page. To get Dr. Guilliams’ book The Original Prescription– you can purchase directly from the Point Institute or purchase on Amazon. Posted in To the Point --- Our Blog.Tagged Vitamins.